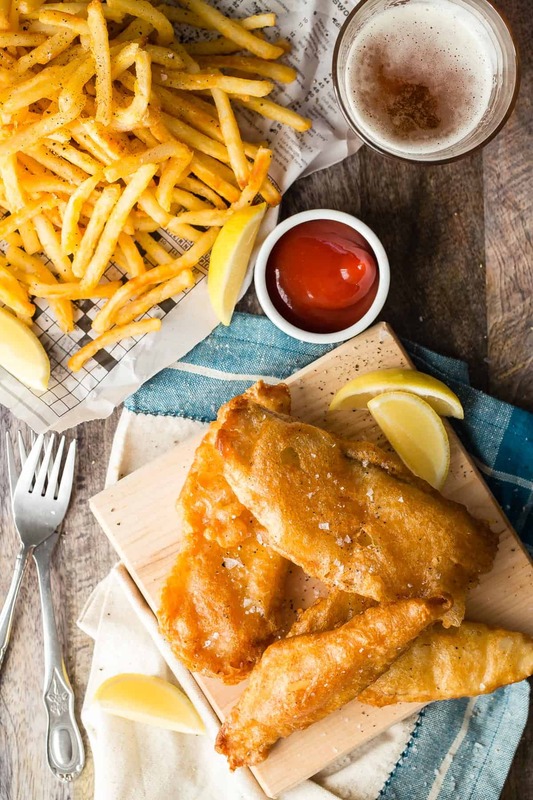 Crunchy Beer Battered Fish and Chips! Who doesn’t like chunks of white flaky tilapia dipped in a beer batter and fried to a golden perfection? Season with sea salt and black pepper with a side of ketchup. Sometimes you can smell or taste a particular food and it opens up a whole library of memories. Beer battered fish and chips are my ticket. A visit to a psychologist would end up with his couch being covered in crumbs, and maybe some ketchup bombs. Because you just can’t have fish and chips without ketchup and vinegar, don’t even try. I’m beginning a new partnership with Regal Springs Tilapia and to say I’m happy is an understatement. The whole family and I are seafood and crustacean lovers, so making tilapia for dinner is an easy one for me. Regal Springs Tilapia are raised responsibly in deep freshwater lakes. Huge floating nets are used but still provide enough room for the tilapia to swim and exercise, which in turn provides a meaty, flaky style fish perfect for all ages. The tilapia are fed a diet of all natural high-quality plant-based food. Regal Springs is responsible for their own feed plants so they know exactly what goes into it, and by using the floating nets the fish can’t get to any algae or unhealthy feed at the bottom, unlike some other fish. Huge in protein, vitamin b-12 and omega-3 but super-low in calories the tilapia makes an excellent choice for any meal. 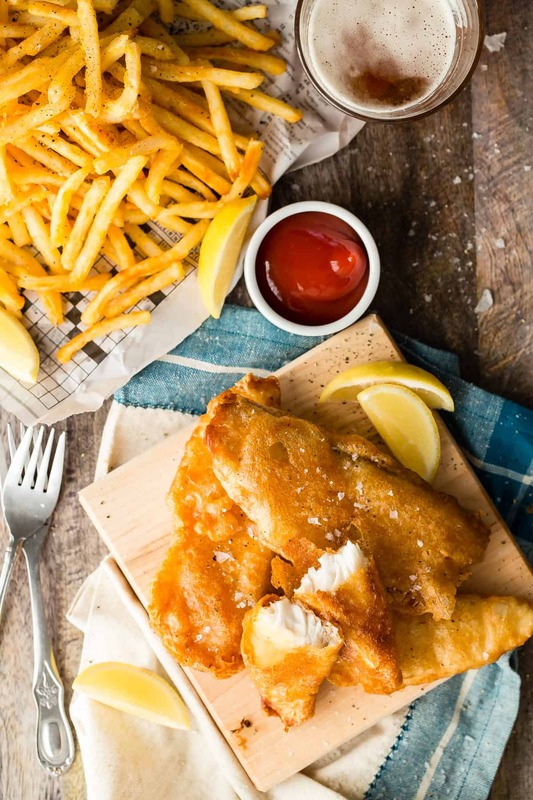 So if all of my tilapia knowledge didn’t persuade you to go out and find some, then maybe you just need to shove some crunchy beer battered fish and chips in your mouth! I can guarantee that after you try this crispy-flaky-crunchy batter, you’ll know exactly why I mentioned the memory triggers. I grew up in Scotland so I would say I’m kind of an expert on this delicacy. The batter is so simple. 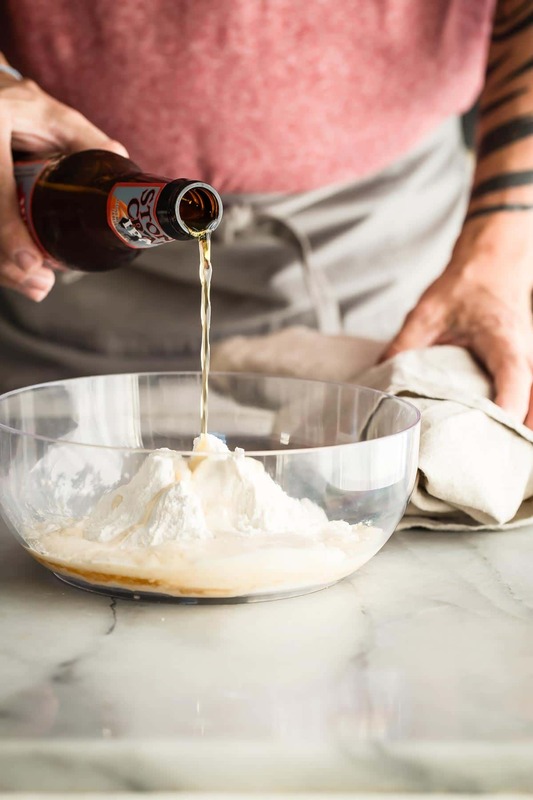 Flour, beer of your choice but I always like to use a good quality dark beer like an IPA or amber. This will help kick up the flavor. Salt, black pepper and a dash of paprika and boom, you have an instant batter for dipping. 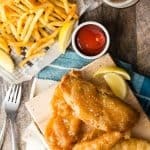 Don’t let the cooking in oil part of the recipe put you off, once you bite into these chunks of flaky white fish and chips you’ll see that it’s so worth it! This post is part of a collaboration with Regal Springs Tilapia. All thoughts and opinions are always my own! 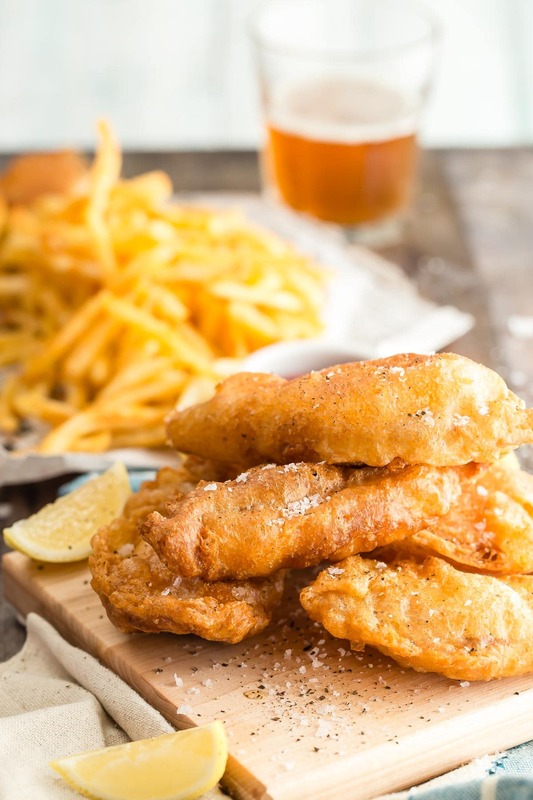 Crispy and crunchy this beer battered tilapia makes the perfect dinner choice!! Pour the canola oil into a deep pan or pot and place over a medium heat. The oil should be about 2 inches deep. In a bowl add 1 cup of the flour, beer, salt, pepper and paprika. Cut the tilapia into strips and pat dry. Once the oil has reached 375 degrees F, start to fry the fish. Roll each piece into the flour and shake off the excess. Next dip the fish into the batter and let the excess drip back into the bowl. Take the fish from the oil and place on some paper towel to drain. You will have to do this in several stages so it's a good idea to place the cooked fish on a baking sheet to keep warm in the oven while you continue with the remaining tilapia. Serve with the fries, seasoned with extra salt and pepper and ketchup on the side if desired. Perfection. Seriously, I will be dreaming about this! I’ve never made fish and chips at home, something my husband may not ever forgive me for. Thank you for inspiring me to give it a try! I’ve got to try this recipe soon! There is almost nothing quite as tempting to me as a perfect fried fish. This looks like just that! I’m totally on a Fish and Chips kick right now. Yours looks so delicious! OMG! These seriously look and sound so perfect!! YUMMM! Wow, never realized how simple it is to make fish and chips. Thanks!